Note: The full constellation of signs is rarely seen in an individual. Neuropathy and ataxia are present in about 50% of individuals, but usually manifest after childhood. This enzyme deficiency leads to an ARD-like condition but is accompanied by high plasma concentrations of pristanic acid and the C27-bile-acid intermediates, whereas the plasma phytanic acid concentration is low. The phenotype is one of adult-onset sensory motor neuropathy with or without associated pigmentary retinopathy [Ferdinandusse et al 2000]. Usher syndrome type 1 is characterized by a congenital, bilateral, profound sensorineural hearing loss, vestibular areflexia, and adolescent-onset retinitis pigmentosa. Inheritance is autosomal recessive. Usher syndrome type 2 is characterized by congenital, bilateral, sensorineural hearing loss predominantly in the higher frequencies that ranges from mild to severe; normal vestibular function; and adolescent-to-adult onset of retinitis pigmentosa. Inheritance is autosomal recessive. Usher syndrome type 3 is characterized by progressive sensorineural hearing loss and adolescent-onset retinitis pigmentosa. Inheritance is autosomal recessive. Alström syndrome is characterized by cone-rod dystrophy, obesity, progressive sensorineural hearing impairment, dilated cardiomyopathy, insulin resistance, and developmental delay. Inheritance is autosomal recessive. Kearns-Sayre syndrome (see Mitochondrial Deletion Syndromes). Kearns-Sayre syndrome (KSS) is defined by the triad of onset before age 20 years, pigmentary retinopathy, and progressive external ophthalmoplegia (PEO). In addition, affected individuals have at least one of the following: cardiac conduction block, cerebrospinal fluid protein concentration greater than 100 mg/dl, or cerebellar ataxia. Sensorineural hearing loss is seen in almost all affected individuals. Kearns-Sayre syndrome is due to deletion of mitochondrial DNA (mtDNA). Sjögren-Larsson syndrome is characterized by congenital ichthyosis and onset of ataxia in early childhood. 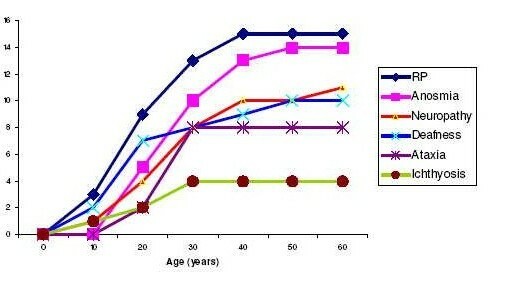 High CSF protein concentrations can be found in a variety of conditions.